Phi Phi Island is the most famous Island amongst the tourists. Even if people are visiting Thailand for a short time, Phi Phi is in the list. The Island is said to be the greatest attraction for tourists all around the world. There is so much to see and explore that everyone can easily find something of their interest at this place. Basically Phi Phi is a group of six islands and stands high to the south east of Phuket with its limestone mountain cliff, green forests and amazing white sand beaches. 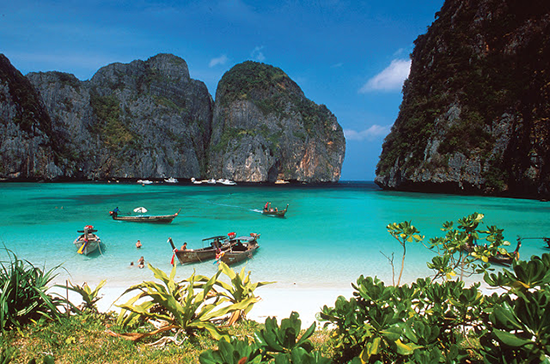 Two of the most famous Islands of the Phi Phi group are the “Phi Phi Don” and the “Phi Phi Le” Island. When I visited Phuket I was on a mission to explore all small Islands around the place but the attraction and magnetic nature of Phi Phi Island made me alter my plans and I decided to spend good two days to experience the most memorable days of my trip. I went in March which is said to be the hot season of the Island that starts from January to April and than comes the other season of the Island that is the rainy season which starts from April to December. The pattern of rainfall is heavy but for short irregular intervals. If I start with all the attractions of the Phi Phi Island, the page would extend its limit. So let’s give a quick look at what you can expect from a trip to the Phi Phi Island. Snorkeling in crystal clear waters, swimming, climbing, water sports, cliff jumping, cruising, sight seeing, and even Thai cooking classes for the foodies is small list. Phi Phi Island has mesmerizing beaches and colorful corals to take your breath away. Besides this you can visit the highest view point of the Island and take deep fresh breaths, relax and click some pictures as the view here is amazing. There are a lot of private adventures that the Island offers with Disney like attractions, state of the art décor and fun filled activities like shooting ranges, adventure rides, theatre, haunted house, 4D with awesome effects and a lot more to add some amusement to the trip. The Island has all modern facilities, massage parlous, traveling services, luxurious hotels and everything you need to make your trip reminiscence.